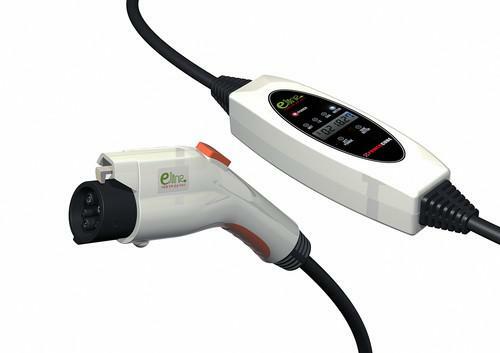 The EV-Line is a portable electric vehicle charging cable fitted with RFID tags that would allow drivers to charge their cars almost anywhere through standard power outlets. Seoul is trying to put one of the world's highest concentrations of electric vehicles (EVs) on its roads with a project that would let drivers charge their vehicles in residential parking lots and other everyday locations. The city is planning to give out electric charger cables fitted with RFID readers that would allow drivers to recharge their batteries through standard power outlets at 100,000 locations -- a huge increase from current numbers. Central to the project is a charger cable called the EV-Line, developed by Gyeonggi-based Power Cube. The cable has an RFID reader than can scan an RFID tag attached to power outlets in parking lots for apartments, offices and elsewhere. It also has a 3G wireless module. The system then transmits the driver's identity, along with the time, place and amount of electricity used, back to Power Cube. The user gets billed later and Power Cube in turn pays the national electricity provider, Korea Electric Power. The setup is designed to make recharging easy for drivers, who can top up their batteries at a convenient time and location instead of having to go to a dedicated recharging station. "The biggest problem in Korea is securing charging spots in cramped parking areas in apartments," said Shin Kyu-sik, director of Power Cube. Nearly 84 percent of Seoul residents live in apartments as opposed to individual houses with a garage. According to government data, there are 911 EVs and 935 charging stations in Seoul. Nationwide, there are 3,044 EVs and 3,201 stations. Most of these vehicles, though, are owned by public-sector entities. The Seoul Metropolitan Government wants to encourage private ownership and will provide electric car buyers with the EV-Line charger for free. It aims to secure 10,000 designated spots for EV-Line users by the end of the year and 100,000 by 2018. To do that it will have to negotiate permissions with landlords and get safety approvals. The EV-Line costs about 1 million won (about US$917) per device, which is a sixth of the cost of building a vehicle charging station, said Han Myoung-sil, a deputy director with the Environment Ministry's green transportation team. "The portable chargers could be an option for consumers because of the affordability and convenience, but they might not replace regular charging stations because we still don't know how smoothly they'll work in reality," Han said, adding users' data privacy and security are also a concern. One downside is the time it takes to juice up a battery. The EV-Line charges at about 3.3 kilowatts per hour, so it takes six to eight hours to fully charge a car battery, compared with a regular public EV charging location, which charges at 8 kilowatts per hour and takes half the time, Shin said. Users can keep tabs on the charging progress with a mobile app. The Environment Ministry has been encouraging residents to adopt more environmentally friendly cars since 2011. It has distributed free electric cars and motorbikes to public workers and made them available for rent by the public. Participating EV makers include Kia Motors, Renault Samsung, General Motors and BMW.